If your going to want to run any sort of electrical equipment during the time you spend on your narrow boat, then your electrics will be pretty important! From your lights, to TVs, Fridges and PCs, electricity is essential for your comfort, and in some cases safety. Although there are alternatives in some cases (Gas fridges for example), you probably won't easily be able to do without at least 12 Volt power on your barge. Below is outlined the basic choices you can make regarding the power on board, and some recommendations for good practice. Remember, unless you are confident of your abilities, you should not attempt to install any electrical equipment, as especially with 240 Volt power it can be deadly. Electrical equipment onboard your craft is covered by the EU Recreational craft directive and the boat safety scheme. Details of these can be found elsewhere on the site. A single Battery System which both starts the engine, and powers your basic household appliances. This is only suitable for small craft and cruisers and will only support a few internal lights, a radio and navigation lamps, should you ever require night cruising. In this case a "Leisure battery" of around 70 Amp-hours is the most appropriate choice. Although larger batteries may be used, they may be inconvenient to transport if trickle charging is required. A twin circuit may be used on larger craft, and is a step up from the single circuit layout. This splits power between 2 sets of batteries. One for Starting the engine, and the other for all domestic applications. The most obvious advantage of this is that should you run the domestic battery down, it is still possible to start the engine and recharge both sets of batteries. This system requires that you be able to isolate the batteries from each other, which is easily achieved using a four positions switch, allowing both, one, or none of the batteries to be connected to the system at any one time. In this case, your choice of battery is important. For Narrow boats, you are best to use around a 105Ah starter battery as well as multiple 105Ah batteries for the domestic electrics. You will be able to decide how many batteries you require depending on the number of appliances you intend to fit by talking to an experienced electrician, specializing in Marine applications, or at a boat yard with their own electrician. The number of batteries will also depend on the number of hours you will be running the engine for during the day, and how many hours you will be draining the battery at night. In this kind of circuits, it is common to install an automatic charging system to ensure that you do not run your batteries flat. These come in several forms, a "blocking diode", which allows electricity to run from the alternator into both battery banks, but not from the starter battery into the domestic battery set. The problem with this is that the diode reduces the voltage by around 0.65 Volts, which may lead to the batteries being permanently undercharged. 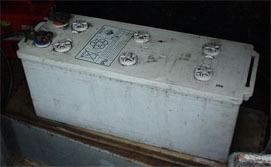 The alternative is to use a relay which links the two sets of batteries together, when underway, and disconnects them when the boat is stationary. In most marine applications, the alternator, mounted on the engine, is the main battery charging device. For boats with a single starter battery and one or two domestic batteries on a low drain system, this is adequate, although in the case of more demanding systems, a larger, or second alternator (often belt driven) may be required. An Inverter is designed to draw Direct Current from the batteries on board, and convert it into 240 AC. Depending on the size of your inverter, you may need to double up your banks of batteries, or install a separate set of batteries (still charged off the engine using a three way blocking diode). A Self contained generator has several advantages and disadvantages over the other methods of 240 Volt Powering. It can deliver high outputs of over 2.5 Kilowatts, and is suitable for powering high drain Appliances such as ovens. Unfortunately Generators are bulky, noise, and cost around £5000 to install. A fairly recent development in boating electrics is the 240Volt Alternator, which is installed on the engine and can provide up to 3.5 Kilowatts of power for around £2000 pounds. The main disadvantage is that you must be running the engine in order to access the power it provides.